Near nature and seemingly near everything else, Dishman is the place where families grow together and stay together. It’s a perfect blend of city park and country wilderness, yet doesn’t compromise the best of each. “There’s always something new,” said Doug Chase, director for Spokane County Parks, Recreation and Golf. “At different times of the year that scenery is constantly changing. “You can be barely in the park and feel like you’re 100 miles away,” he said. Climbers transport themselves back 15,000 years, when the granite chunks were formed by the Missoula flood. Amid the rocks are ravines and ponds, which support deer, coyotes, pheasant, frogs and dozens of species of butterflies. Contained in the area’s 530 protected acres are miles of meandering trails flanked by more than 300 different flowering plants. 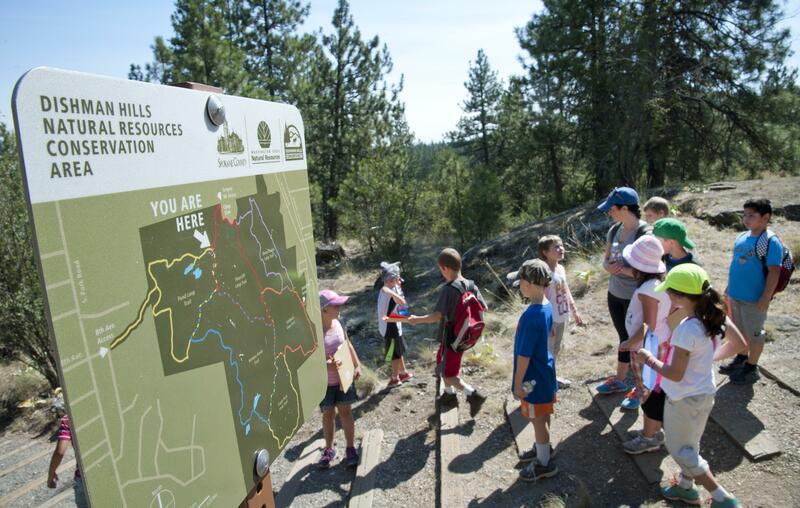 The fun begins at Camp Caro, which serves as the northern gateway to Dishman Hills but is its own entity in the county parks system. Camp Caro is a children’s delight, a 5-acre traditional park with spacious greenery and the ubiquitous Camp Caro Lodge, which accommodates 75 and is available for rent from May through October. “Folks who come to Camp Caro are always surprised – it’s a hidden gem,” Chase said. Caro is flanked by rising bluffs, rock outcroppings and the natural area. A few more steps take the hiker into dense forest, where it’s possible for a father and his two sons to lose their bearings and be guided home only by the distant sound of autos whizzing along Appleway Boulevard. Climbing out of the brush, hikers find their way to Eagle Peak and a panoramic view of the Spokane Valley. The far reaches of the park reveal a landscape changed by wildfire. Wildflowers and saplings share the ground with downed trees scarred by fires. On a good day you can catch a glimpse of Mount Spokane; then again, there’s no such thing as a bad day in Dishman Hills.